The Tomato Rebuild–Machining Technology is Crucial to Modern Society, by Thomas G.
Have you ever really thought about your food? The intricate system that conveys it to your fingertips, and often to your mouth directly? The complicated processes and machinery that make everything run so smooth? You mat be amazed at the phenomenally complicated process involved in bringing that jug of milk, candy bar, or perhaps a simple tomato to your feast. This is an abbreviated sequence with the express purpose of shedding light on a dwindling craft: Machine work. While this trade is flourishing around the world, we here at home have swept it under the rug in favor of cheap imports and strip malls. This may soon come back to bite us. And it will be hard. Try this illustration. After wandering about the store, pick up a tomato. Average sized, normal red, no cuts no bruises, Nothing special right? Wrong. Start hefting the tomato, looking at it from all sides, studying it with more fascination than could possibly be warranted for “just a tomato”. After a while start thinking… How did this get here? And why is it so similar to all the rest, sitting here in a box along with hundreds of brothers neatly packed inside? Well, never rejecting the oddball challenges, lets begin to think backwards through the process. The last thing that was done was a store clerk rolled it out there on a pallet jack with twenty other boxes. Hmmm… pallet jack. A small hydraulic jack whose piston and cylinder have been turned on a lathe to an exact specified size, then precision ground to within a couple of ten thousandth parts of an inch. Take your average sized hair, divide it up long ways thirty equal times, that is near .0001″ or one ten thousandth part of an inch. The valve housing was drilled and tapped and cut to size in a fixture on a milling machine. The whole pallet jack was fabricated and welded up by skilled craftsmen. Wow, that is intense, and its just the tip of the iceberg! What else is not as simple as it seems? Lets keep going. Well, it got here in a big semi truck. The trailer may have been built from extruded aluminum. The extrusion dies having been cut on a Computer Numerical Controlled (CNC) milling machine, The pistons of the large diesel have been precision turned on a lathe to about plus or minus .0005 inches. Then placed in a mill and given its flat sides, and the precision bored hole for the wrist pin. The dashboard of the truck was made by the injection molding of plastic.) The mold being cut from a large chunk, or billet, of high grade tool steel on a CNC machine cutting in three axis simultaneously, (X, Y and Z) The entire truck is assembled with nuts, bolts screws and rivets, Every one of these came off a screw turning lathe, most likely somewhere in Taiwan or Mainland China. Each one of the 18 wheels was cut from a big billet of forged aluminum on a large CNC lathe. The gears, the axles, the bearings, everything goes back to a machine tool at some point. So, at the plant, these tomatoes ran through the gauntlet of an enormous system of computerized cameras to check for color, size, blemishes and sugar content, along with washing waxing and labeling machines. All this is achieved on miles of conveyor belts running on thousands upon thousands of rollers axles, gears, bearings, mechanical fingers and arms, motors, and actuators. Every gear was cut on a lathe for its outside diameter, and later to a four axis (X Y Z and A) indexing mill to cut each tooth. Every one of these parts had to be machined on a machine tool directly or molded from a machine tool cut mold. Need I even mention the intricacies of a modern combine harvester being a combination of a tractor, harvester, conveyor and loading system, and sometimes even packaging plant? The manufacturing world is based completely on the interchangeability or parts derived from the accuracies of modern metalworking machinery, and their machinists. One of Man’s claim for dominance in this world, besides being Children of God, is the use of tools. The machine tool is the pinnacle. These tools solve innumerable problems, such as building the machines to process tomatoes, looms to make cloth, printing presses for publications, molds for cups… The list goes on almost without end. But unlike power looms, printing presses or tomato processing machinery, the machine tool is self replicating. Meaning that if you have a lathe and a milling machine, you can build yourself another lathe and milling machine to continue solving more problems and conceivably create more machine tools. Can a loom build another loom? Remember how machine work and most other skilled work like it have been pushed aside by cheap imports? Here comes the big bite. The inability of the US to import enough basic “stuff.” Oil, machine tools, computers, medical equipment, sponges, toothpicks etc… combined with our lack of an industrial infrastructure to take up the slack will result in, well, nothing. And that will last for a long time, until we re-build that infrastructure. Modern US manufacturing is dependent on CNC machines. In a grid down/EMP situation, all this incredibly productive machinery will be completely 100% worthless, except as scrap. Although scrap is very valuable, it is not directly valuable as a machine tool. Without their computers, stepper and servo motors, glass scales (for precise measurement), and especially without tons of power, these amazing machines can not function. You can’t even take the motors off the axis and put hand wheels in their place because all the measurement is digital. China, India, and other developing nations will not fall as far back as we will during a global crisis. They’re not nearly as dependent on others for their basic commodities. For example they make their own basic fasteners, their own hand tools, and basic human necessities, nearly everything. Including and especially machine tools. Also, they do more work by hand, scraping, honing, lapping, and filing. These are basic metalworking operations that can be key in machine tool fabrication. The US has lost most of the people who know these skills. These I can think of only three machine tool makers who still construct machines here. HAAS, Hardinge, and Moore. Probably a couple more, but not many. In the US this is becoming a lost art. Third world countries rely more heavily on manual machine tools, which have integral mechanical position indicators. This is key for our infrastructure to be rebuilt, the manual machine tool. As stated earlier, most CNC machines will become boat anchors without their multitude of motors, computers, hydraulics, pneumatics. Oh, did I mention the tons of electricity to run it all? Not so with manual machine tools. The vast majority of manual machine tools have their position displayed on or near the hand wheels that power their feed and position axis. Notice the words hand wheel. Generally these machines rely on a motor to turn the spindle only. Other functions, many times, are powered off the spindle. This gives much more ready access to their belts, gears and motors, and it can conceivably only take one belt to power the whole setup. This makes these machines much more inclined to operate on alternative energy sources, such as hand cranks, leather belts and steam (or Lister) engines, bicycle chain and pedals, foot treadle, windmill, waterwheel, etc… Most can live without compressed air, hydraulics and digital readout displays. As an example, I have recently cut special round and buttress formed threads while pushing the lathe spindle around by hand. These threads were not your ordinary 1/4-20 from your local Ace Hardware. I had to grind the shape into the high speed steel (HSS) tool bit by hand. The tools simply did not exist in any metalworking catalogs. This is the next key. The fundamental most basic cutting tool is a hard flat rock. Something to sharpen and form cutting tools and others. In its basic form it is a flat rock. In an advanced form it is a pedestal grinder. We won’t discuss the more advanced types. Since there will be conceivably very few to nobody selling cutting tools, and postal services not likely, these will need to be fabricated in-house. Find an antique hand crank grinder at an antique shop or on eBay. Many still have years of life left. Many have no life left. It is a crap shoot. I’ve purchased two, one old and one brand new. The brand new one from India was worse than the old worn out one which I had already disposed of. Possibly a better solution, and much less of a gamble, will be to modify our existing pedestal grinders. This is quite simple, as they have standard sized shafts, and they have bearings inside. (Good grinders spin for minutes after power is removed.) Simply buy a small pulley the same size as your grinder spindle from mcmaster.com for about $4, and replace one grinding wheel with it. This can be hooked up to a big pulley with a hand wheel and any number of other alternate energy sources. Try and get a 6-to-1 ratio or more. The pulley can be put in place when the Schumer hits the fan and the grinder is still serviceable in our modern world. Very useful machine tool – Done. High speed steel will be king in these days. The benefits of HSS for survival are; It is cheap, HSS is 5 to 50 times less than carbide. I just priced HSS blanks at kbctools.com from $0.90 to $10. People tend to think of them as strictly for a lathe. Not so, as we shall see. They are re-sharpenable with the ubiquitous gray aluminum oxide wheel. Depending on how dull they have become, smooth rocks like a whetstone or sandpaper, may work. They can be re-sharpened for more than 2/3rds their entire length! As long as you can get a bite on them with your tool holder, it is long enough. It also uses slower speeds than tungsten carbide. Its called “High speed steel” because back near the early part of the 20th Century when it was developed it was a huge advance over what people were then using – high carbon steel. This is the steel used for files, chisels, punches, and other heavy duty uses. This is the next option when the High speed steel is all depleted. It just needs slower speeds and feeds. Much of the above pertains to both the basic lathe and milling machine. Now specifically though for the milling machines. 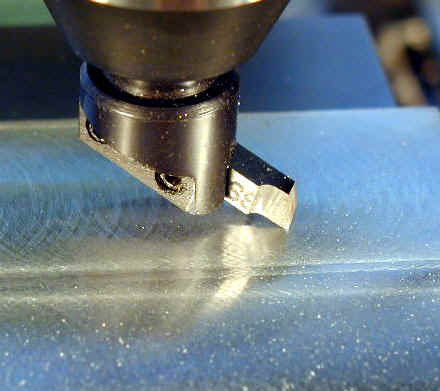 A milling machine normally uses what is called an end mill. An end mill looks similar to a drill bit but cuts not just at its point, but on its sides as well. These kinds of cutters will be great to have, but they will run out eventually too. The great difficulty in the manufacture of these cutting tools is prohibitive to reproduce in hard times. It takes a highly complex system of grinders, usually CNC, and we all know how useful those will be after these huge solar flares coming in 2011-to-2013. Manual re-sharpening is very complex, and still involves a complex machine tool with air bearing helical indexing fixtures and grinding wheels. For example, a cheap end mill sharpener costs $4,000. Luckily all is not lost with the mill. It is possible to use a milling machine with cutters ground out of the same HSS blanks used primarily for the lathe. (Or, when push comes to shove, hardened high carbon steel) All they need is to be mounted in special holder called a fly cutter. A much more survival style machine than the milling machine is the obsolete and no-longer produced metal shaper. This is not like a modern woodworking shaper. This machine can make flat surfaces, grooves, T-slots, and internal and external key ways. (Internal is near impossible with a mill.) This tool pushes a cutter across the surface of the workpiece much like a wood plane cuts. No rotation of the tool or workpiece. It makes incremental steps across or down the workpiece for flats, grooves, etc. The great benefit is that it uses the same HSS blanks as your lathe turning tool and mill fly-cutter. This machine can use very simple cutters to make very complex details and shapes. More extremely basic tools necessary for survival metalworking are files. These tools have been around since 1200 B.C. in Egypt. Their manufacture is difficult when not mechanized. Its manufacture was even shrouded in secrecy by the file-makers guilds for hundreds of years because they were such a valuable tool. Just think, blacksmiths, gunsmiths, clock makers, and locksmiths have made guns, locks clocks and precision movements for centuries with the most rudimentary of metalworking tools; a forge, and a file. With enough practice and knowledge, even making taps and dies is possible by filing. Hacksaw blades are not necessarily super old tech, but they are just about the only hand powered way to cut thick sections of metal. These will cut through most materials, but they take time, which there ought to be plenty of again. Taps, dies and drill bits are all going to be worth their weight in gold. Consider “roll form” taps. They don’t cut the metal, they push the metal around and make the threads. They are all the rage in machine shops for a reason – they last a long time and seem to never wear out. Find yourself an old fashioned egg beater style drill. It’s mighty hard to turn a drill bit by hand through any material, even plastic and wood. Again, I haven’t found any new[ly manufactured] ones that are worth considering. Buy reprints of out-of-print books on old time skills from Lindsay Books. These classic books teach old fashioned basic skills from homesteading, blacksmithing, metal casting, steel making, boiler making and producer gas (extensively used back in the thirties to power automobiles, now usually called syn-gas or underground coal gasification) all the way to machining, wind generators, electronics, and backyard ballistics. Incredible resource at decent prices. You’ll love them. Get your own copies. If your budget permits and all your other supplies are already together, consider a small lathe and mill from kbctools.com or grizzly.com. Both companies send out free toy, ahem, tool catalogs. Also, most used machine tools are still very serviceable, and in larger metropolitan areas there are machine tool re-builders. They can make a machine like new again. They posses many of the useful skills to restart the precision metalworking economy. If you have interest in learning the machining trade, even as a hobby, you might consider a junior college class in machine tools. The machines are not self explanatory. Most levers and handles are not labeled and you will really hurt yourself without proper training. Encourage your kids to at least give machine shop a try. We need them. I recently heard a machinist of 30 years explain this to his co-workers. This is an example of how we are losing our manufacturing knowledge base, and how not to encourage your kids to try machining. In an economic depression, my reasoning tells me that people won’t buy new. But they will need the old repaired, and that takes replacement parts. Cuba, because of the trade embargo, has a fleet of 1950s-vintage cars looking fine and running well because they make all their own replacement parts. This is done with machine tools and skills. In a total rebuild, we’ll need everything again. Those who are knowledgeable and posses those tangibles, HSS blanks, lathes, mills drills, taps, dies, files, hacksaws, shapers (if you can find one) and non-digital precision measuring equipment are possibly set to become wealthy. If nobody else can do it, and it doesn’t come from China anymore, then where will it come from? Machine shops, machinists, welders, and blacksmiths. — Our modern society rests upon machinists and their tools. Everything traces back to a machine tool. — Manual machine tools will be our best shot because of integral measuring and ease of using alternate energy. They often have one motor and will be easier to use leather belts et cetera.